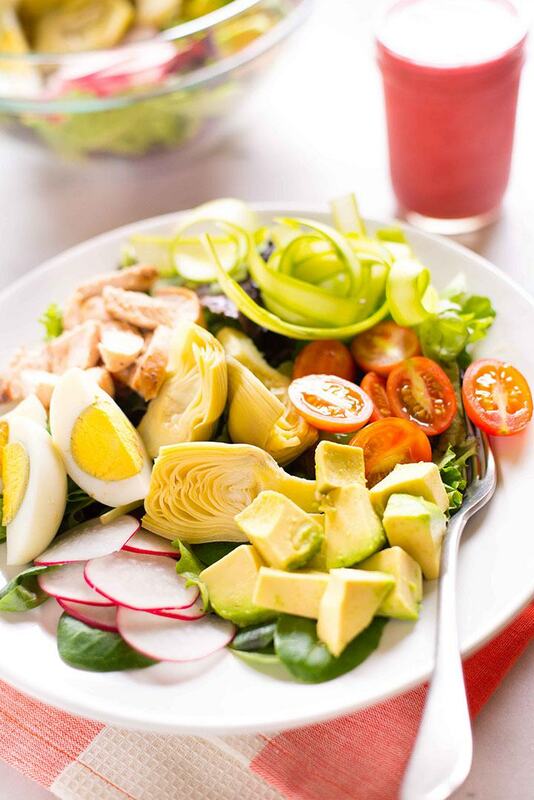 Welcome to Day 5 of the Spring Into Health Lunch Challenge! One of the great things about a challenge is it helps us stack good decisions on top of themselves and starts building our inner confidence. You start to realize that you can have the power to make these choices. And that they are actually easier than you thought they would be. It just takes a small step and then another small step and, then, pretty soon you’ve made it! Is there something you’ve always wanted to accomplish but have been too afraid to go for it? Today is the day to bust through those walls. Take a step towards one of your goals. I know you can do it! …just like I know you’re gonna love our lunch today. 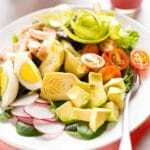 We have a great salad to take on Day 5 of the challenge: a Springtime Cobb with Raspberry Vinaigrette. Nom. 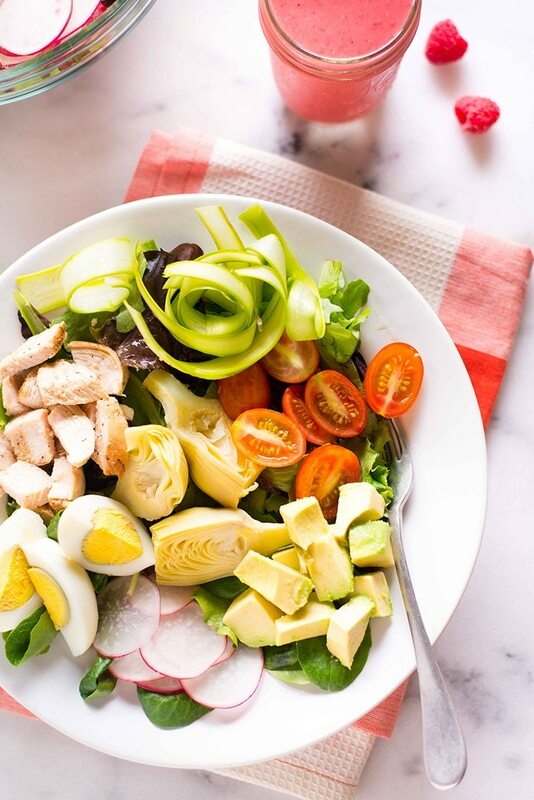 Before you go to prep your lunch though, I’d LOVE for you to head on over to the Take Back Your Health Community and share a goal you have that you’ve been afraid to get started on. I’ll go first. I’ve been afraid to dive back into my gym routine after getting allergy-induced asthma. Bleh. Anytime I get sick or have to miss for a little bit, it is just so hard to get back on track and usually takes me a few weeks to finally get in a good rhythm again. But, today I was back in the gym and it felt great :). Thanks so much for participating in this challenge – you’re doing great! If you haven’t yet joined the challenge, come check it out for free by signing up here. 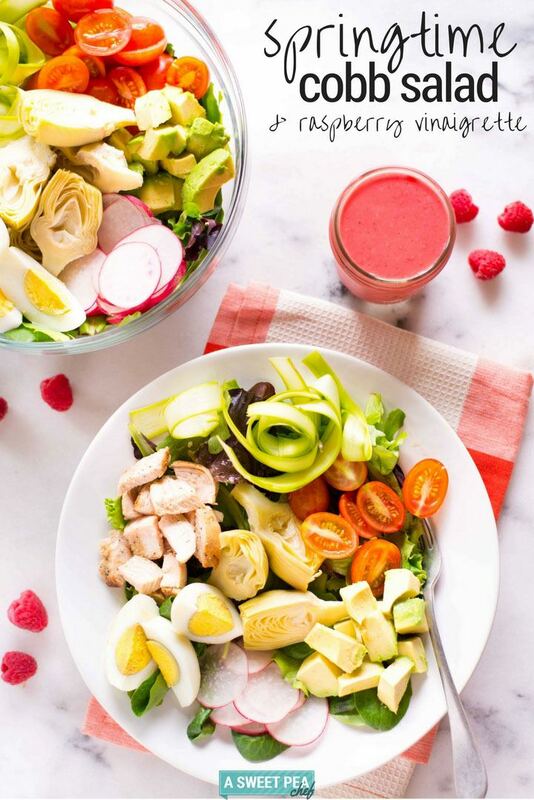 We’re on Day 5 of our free Spring Into Health Lunch Challenge and we’re enjoying a special Springtime Cobb Salad with Raspberry Vinaigrette that is one of my favorite cobbs ever and PERFECT for Spring. Add the seasoned chicken and cook 4-6 minutes on both sides until well browned and cooked through. Remove from skillet and dice into small, bite-size pieces. Slice the root end off the asparagus. Holding the tip of an asparagus spear, carefully slice into thin ribbons using a vegetable peeler. Repeat with remaining asparagus spears. Set aside. To make the raspberry vinaigrette, in a blender, combine fresh raspberries, olive oil, red wine vinegar, raw honey, sea salt, ground black pepper, and water. Puree until very smooth. 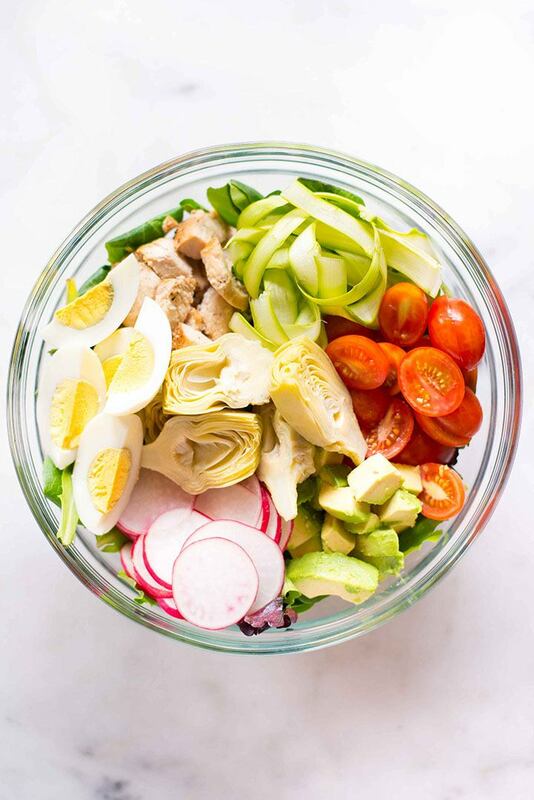 To assemble the salad, in a large mixing bowl, combine the baby spring lettuce mix, followed by the diced chicken, asparagus ribbons, halved grape tomatoes, diced avocado, thinly sliced radishes, and hard boiled eggs, and halved artichoke hearts. To serve, drizzle with the raspberry vinaigrette and enjoy. 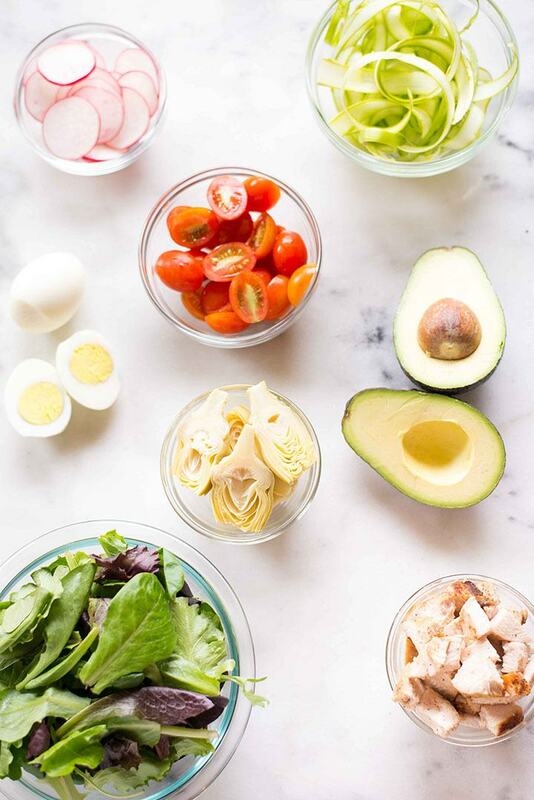 If you’re prepping this salad ahead of time, make sure to stack it using a quart sized mason jar, starting with the vinaigrette at the bottom, followed by the harder vegetables like the tomatoes and asparagus, keeping the more delicate greens and cheese for the top. Or you could toss it all together without the salad dressing and then drizzle it over when you’re ready to enjoy. 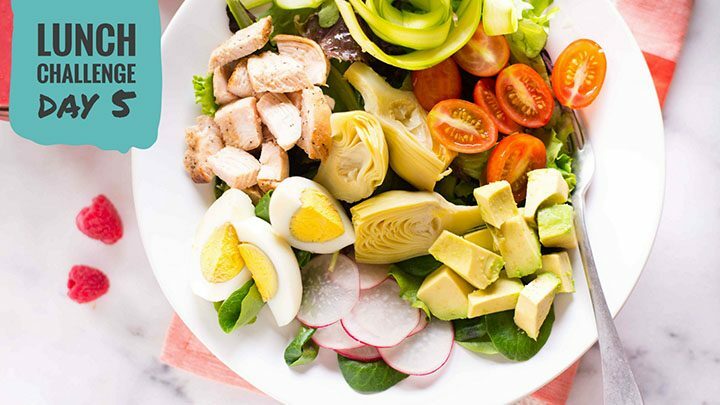 There’s still time to sign up so come join our free 7 day spring into health lunch challenge so you can get in on all this tasty, healthy lunch goodness that’s going on right now! Love cobbs especially with tasty dressings.